Russia will block any move at the UN Security Council to impose sanctions on Syria or authorise the use of force, its foreign minister has said. Sergei Lavrov said Russia would not be able to prevent military intervention, but that it would veto any resolution at the Security Council authorising it. 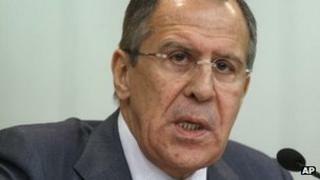 Russia has tabled a resolution critical of both sides in the 10-month uprising. Meanwhile, the UK has accused Iran and Lebanon's Hezbollah movement of helping the Syrian government suppress dissent. Prime Minister David Cameron told parliament that evidence had emerged that Tehran was supplying arms to the Syrian security forces, saying Turkey had intercepted some "particularly interesting" shipments. "People should also know that Hezbollah is an organisation standing up and supporting this wretched tyrant who is killing so many of his own people," he added, referring to Syrian President Bashar al-Assad. Mr Cameron also promised that the UK would "lead the way" in tightening sanctions against Syria, including asset freezes and travel bans. Diplomats in Brussels also said EU foreign ministers were planning another round of sanctions targeting the Syrian government. The UN says more than 5,000 people have been killed since March. On Wednesday, activists said at least 10 people had been killed by security forces, including six in the central city of Homs, where there were earlier reports of explosions and heavy gunfire. The failure of an Arab League observer mission to help stem the violence since it arrived in Syria last month has prompted opposition leaders, several Arab nations and the West to urge the Security Council to act. Some have proposed international sanctions, others military intervention. On Sunday, the emir of Qatar became the first Arab leader to propose that troops should be sent to Syria to stop the crackdown on dissent. Syria's foreign ministry said it "absolutely rejected" the call and that such a move would "worsen the crisis... and pave the way for foreign intervention". On Wednesday, Mr Lavrov said Russia would block any attempt by the West to secure a UN resolution supporting sanctions or the use of force. "If some intend to use force at all cost... we can hardly prevent that from happening,'' he told a news conference in Moscow. On sanctions, he added, "the red line is fairly clearly drawn". The Security Council has been unable to agree a resolution on Syria since the uprising began. In October, Russia and China vetoed a draft condemning the attacks on protesters and threatening sanctions. Mr Lavrov also accused Western countries of being one-sided and failing to take into account what he called acts of terrorism by opposition groups. In a recent speech, President Assad again blamed a "foreign conspiracy" for the uprising against his rule. Officials say "armed gangs and terrorists" have killed at least 2,000 personnel from the security forces. China meanwhile defended the Arab League's observer mission, saying "the security situation of major areas has improved" since it arrived. "The Chinese side calls on all parties in Syria to fully co-operate with the Arab league in its mediation efforts. The Chinese side supports the settlement of the Syrian issue within the framework of the Arab league," Chinese foreign ministry spokesman Liu Weimin told reporters in Beijing. The Arab League is due to discuss the crisis in Syria and the future of the observers, whose mandate soon expires, on Saturday and Sunday. Arab diplomats say the Syrian government is willing to extend the mandate of the observer mission and allow in more monitors, but will not allow an expansion of the mission's scope. Meanwhile, reports say troops have resumed shelling the town of Zabadani, which is close to both the capital Damascus and Lebanon. Overnight, an opposition leader in contact with residents said the army had agreed to a ceasefire with rebels inside Zabadani. Radwan Ziadeh told the BBC that commanders had been surprised by the strength of local support for the Free Syrian Army and that many soldiers had defected. The ceasefire appeared to be holding on Wednesday morning, but just before noon mortars were fired, one activist told the Associated Press. Dozens of army defectors were deployed at the entrances to the town to prevent any attempt by government forces to storm it, he added.